Hello everyone, this is Angelina from JoJo and Eloise. It is always so much fun visiting here with you at The 36th Avenue. Now, I don’t know about you but I am in LOVE with summer I mean SERIOUSLY in Love. We are having such a blast enjoying long nights, sleeping in and LOTS of family BBQ’s. One of the other things I am having fun with is, Sewing simple things. I am all about looking for fabric in places that you wouldn’t normally think to look. Most of us shop there for already made clothes, shoes, housewares,toys etc.. Your typical person wouldn’t go there to scope out Fabric. However I am not your typical person, so Target is also one of my go to spots when I am in need of cute fabric. The last time I was there, I spotted this ADORABLE fabric Body Pillow Cover. I immediately grabbed it and new that this was destined to become a skirt. 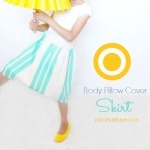 So today I am going to show you how to turn a Body Pillow Cover into an Adorable skirt. First your going to open up your Body Pillow Cover. You will then TRIM off the SIDE and TOP edges. You can leave the bottom in tack because that will be your (already) hemmed edge. Another great thing is, your Body Pillow Cover/ Skirt is already Lined. After your edges are trimmed, you will be placing RIGHT sides together and sewing your Side seem together. Pin in place and make sure ALL your layers are lined up. Finish your RAW edge with a Serged or Zig Zag stitch. For the waist band I used some Cotton Muslin and cut a 3.5 wide strip that measured the length of my (TOP edge) skirt. I pinned and sewed RIGHT sides together. You can go Here and Here for some more waistband tutorials. I pressed my edge over about 1.5 inches and Top Stitched, leaving a small opening for my elastic. I ran my elastic through and sewed the ends together then stitched the opening closed. So Cute and so Simple. be sure to scope out the bedding section for some seriously CUTE fabric. and check out how to make a medical arm sling here. Also find her on Facebook, Twitter and Pinterest. Yes, that is absolutely gorgeous. I know exactly which pillowcase I’m going to use! I love it! I’m planning on making a skirt out of a dust ruffle soon. Definitely adorable!! My girls love it when I make them skirts like this.